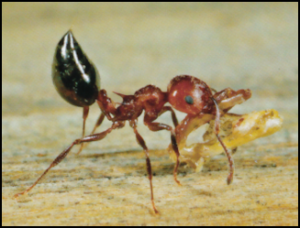 Is It Really A Sugar Ant, or Another Type of Native Texas Ant Species? Habitat: Nest can be found in moist environments, such as beneath siding, vents, or other insulated spaces in or around the home. Characterized by moving fast and erratically with no sense of direction. When threatened, crazy ants send out a scent to attract other ants, and can cause massive damage to electrical equipment, but rarely are a direct danger to humans. Color: Dull black or dark brown, red abdomen. May have wings and large mandibles. Habitat: Colonize in moist environments, where wood is found, such as walls, chimneys, crevices, doorframes, baseboards, etc. Can often be mistaken for termite infestations due to the structural damage to wood that carpenter ants cause. Can bite in defense and potentially cause pain to humans. If you think you have carpenter ants, crazy ants, pharaoh ants, acrobat ants, or any other type of sugar ant in your home, contact the pest control and ant experts at Magic Pest and Lawn immediately.